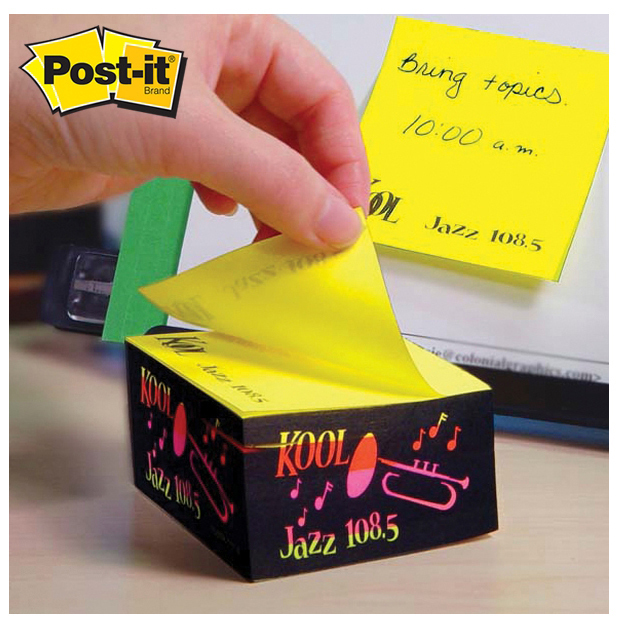 Custom printed Post-it Notes, the marketing tool that keeps on giving, sheet after sheet, year after year . . .
Post-it Notes, the marketing tool that keeps on giving, sheet after sheet, year after year . . .
There’s a marketing tool that found to be very effective in pleasing clients and promoting business. That’s 3M Post-it notes. Post-it Note pads make excellent gifts and promos for every type of business from realtors to doctors to bankers and more. They care custom printed for schools, businesses, churches, clubs, etc. Genuine 3M Post-it Notes have been custom printed for years and each year, the process gets more streamlined and the pads become even more excellent! These are the REAL thing. 3M-Brand. The big plus now is printing four color process (that’s full color) pads for the price of one color. The most common pad sizes are 3″ x 4″ and 4″ x 6″ and living color images are printed on the pads which include full bleeds and any image a customer would like. The post-it notes ship for free and there are never any set-up charges. Logos aren’t the only thing printed on the pads. In fact, many if not most of the post-its are used as advertising tools in that the whole sheet is printed. Ads cover the whole sheet and each individual sheet is stuck to various places for various purposes from pizza boxes to mail boxes, even on bills and invoices that are sent out. Many Realtors have found that Post-its are excellent for keeping their names and business in front of their clients on a daily basis and they have found that by using the pads for advertising, it “sticks” with clients once they see the ads on the pads. Ads on the pads! That’s it! Post-it notes, sticky notes, whatever you call them, are excellent ads generators. But of course, keep in mind that they are used as note pads, too. So many of people are proud to hand out pads to their clients as little gifts that are truly appreciated. Post-it Notes come in all shapes and sizes, the come in cubes, too. Square cubes allow for the sides to be printed (in full color if desired) and these sit on desks and are used for months if not years! Stick your name out there! It is very easy to order. Just send in what you want printed. Email your idea or logo to info@thediscountprinter.com and let us know the quantity (how many sheets would you like total or how many pads total). You can order as little as 6 or 8 pads or as many as 1 million! It’s up to you. The cost is pennies a sheet and they are excellent business generators. ALL OF THE SIZES, OPTIONS AND PRICES ARE HERE.